Getting a private practice internship isn't easy. And truth be told, getting one is easier than having a successful private practice internship. In California, and some other states, you are required to be a w-2 employee. That means you get paid for everything you do in the business. If you don't have any clients, and you are spending 20 hours a week working to find clients- technically your employer should be paying you for all of those hours. That is good right? Yes, and no. What if you spent 25 hours a week for 10 weeks looking for clients, or even just learning on the Internet, but you don't see any clients? Even if your employer/supervisor was only paying you $10 (a bit above minimum wage)- they have just lost thousands of dollars! In addition to your pay, they have to invest in payroll taxes, insurance, worker's compensation, provide oversight, training, etc. They may have lot even more income in lost wages. Taking on a private practice intern is a big deal and a bit of a gamble. Most clinical supervisors don't have time to walk you through every aspect of getting clients. But won't they just give me their overflow? What if their overflow doesn't click with you? What if you dont' instill confidence on the phone? What if you slide the fee everytime? 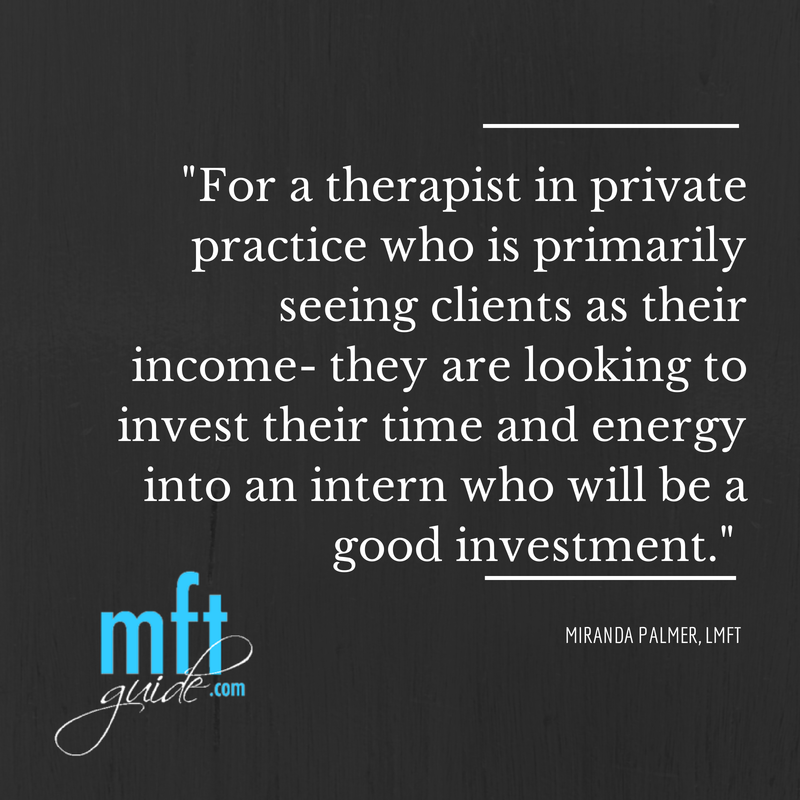 For a therapist in private practice who is primarily seeing clients as their income- they are looking to invest their time and energy into an intern who will be a good investment. You are kind of like stock! You need to show them that you have done some pre-work, you know your stuff, and you are ready to hit the ground running and you know how to not just do good therapy- but how to get good therapy clients. I know that can be overwhelming and anxiety provoking. However, it will be an amazing training ground for your future private practice. I recommend that anyone who plans to go into private practice in the future- start today! Wait- I'm still getting my Master's degree- can I start today? Yes. Wait- I'm not done with my hours- should I start today? Yes. It may be a period of time before you can legally start seeing psychotherapy clients in private practice. However, that doesn't mean you can't start the process of growing a practice today. What can I do as a psychology student or pre-licensed therapist to prepare for private practice? Launch an online presence. Commit to blogging at least 6 times per year (I'd recommend 12) on the topics you are most passionate about. Bonus points if you already know what area you want to specialize in- write on those topics. Launch a community presence. Commit to attending at least 6 trainings per year, and follow-up with 2-3 people you meet at each of those trainings after the event. Develop a list of people to refer to. Get to know what people are passionate about- if they are awesome- refer people to them. Start creating a vision for your practice and add in 3 business trainings per year- even if you don't think you will need it now. Start to create a mental foundation or schema for what building a profitable private practice will look like. Here is a free private practice 101 training you can watch today. There are more things you can do to build a private practice- but let's keep it simple! Post your private practice internship questions below. Did you do something awesome to snag a private practice internship? Tell us about it!